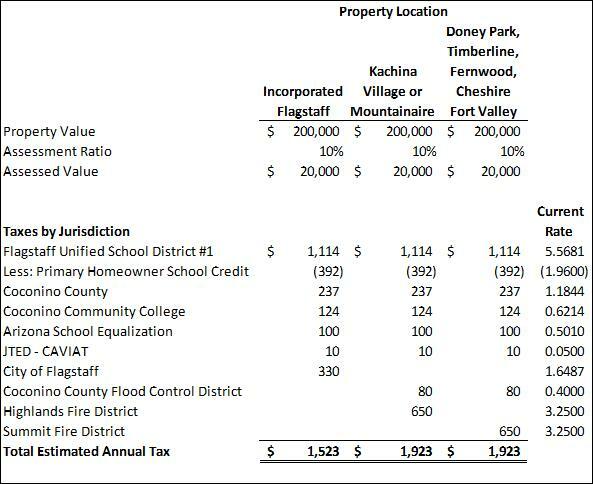 Below are some projected tax liabilities for properties in different Flagstaff taxing jurisdictions. 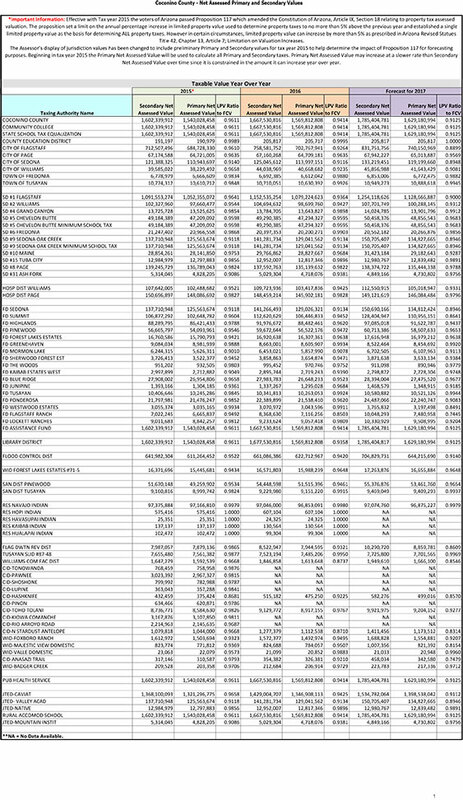 0109 SD#1 FORT VALLEY F.D. 0110 SD#1 MORMON LAKE F.D. 0111 SD#1 HIGHLANDS/(FOREST HIGHLANDS) F.D. 0112 SD#1 MT ELDEN LOOKOUT RD F.D. 0114 SD#1 WESTWOOD ESTATES F.D. 0120 SD#1 FLAGSTAFF RANCH F.D. 0202 ASHFORK SD#31/KIABAB EST. F.D. 0401 SD#4 GRAND CANYON S. IMP.DIST./TUSAYAN F.D. 0402 SD#4 TUSAYAN LIGHTING/FIRE DIST. 0502 SD#5 FOREST LAKES WID/F.D..
0503 SD#5 FOREST LAKES F.D. 0504 SD#5 /BLUE RIDGE F.D. 1001 SD#10 MAINE CONSOLIDATED/SHERWOOD FOREST F.D. 1002 SD#10 MAINE CONSOLIDATED/WOODS F.D. 1003 SD#10 MAINE CONSOLIDATED/PARKS/BELLMONT F.D.